The French do love their witty postcards, and apparently at the turn of the 20th Century they loved their skating too. 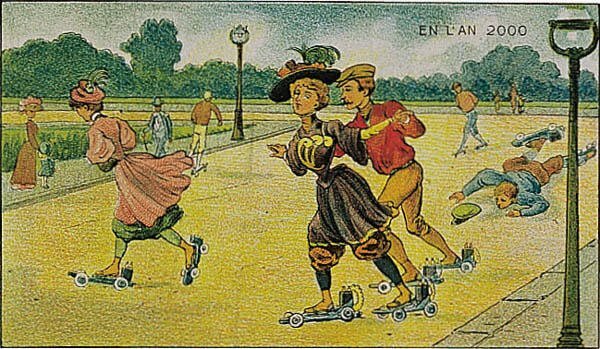 I just saw some fun futuristic postcards made in the 1900s, and among them is one taking a shot at how rollerskates would look in the year 2000. Not too bad! And they nailed the wipe-out. 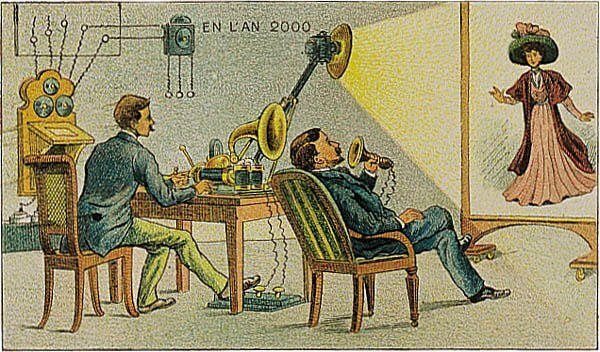 The video-chat one is on the right track though, albeit with clunkier apparatus than we have now. Submitted by roadskater on Fri Sep 21 2012 6:10pm. Thanks for sharing those. I took a while to get there but am glad I looked. Funny how they envisioned the men with tights underwater but never the women. I liked the shave and haricut machine. No way! Never! I liked how much they thought we'd all be flying around with personal wings and not having to bother to walk. They missed how small and powerful speakers would become, and that whole cathode-ray tube or LCD panel. Men's suits were predicted well, sad to say! With the rollers they still had quad wheel setups in mind, and didn't catch wheel sizes going up, but they had the idea for a longer wheelbase for stability. Polyurethane was the key later I guess. Though I recently saw a very old photo of big wheeled skates. Now where was that? Hmm. French I think. Started with R.
It was these...Ritter Road Skates and that explains how I found them, ha! Great photos. Great articles. Road Skates!